Pumpkin seeds not only make carving pumpkins more fun, but they're also a great snack. 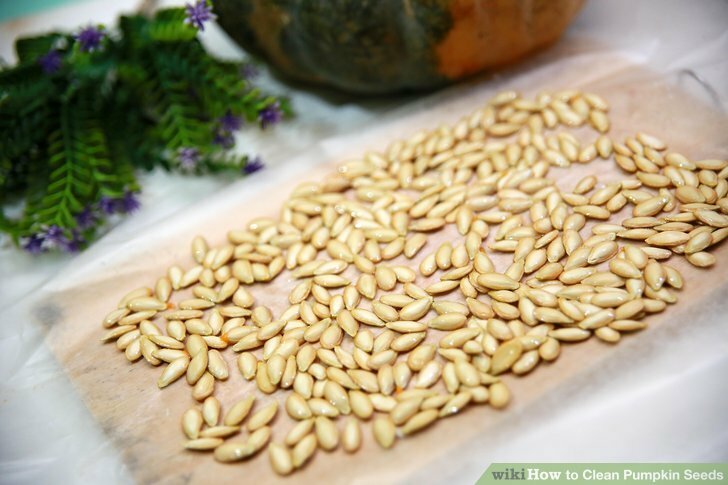 In order to eat them, the pumpkin seeds have to be cleaned to remove all of the pulp and strings. 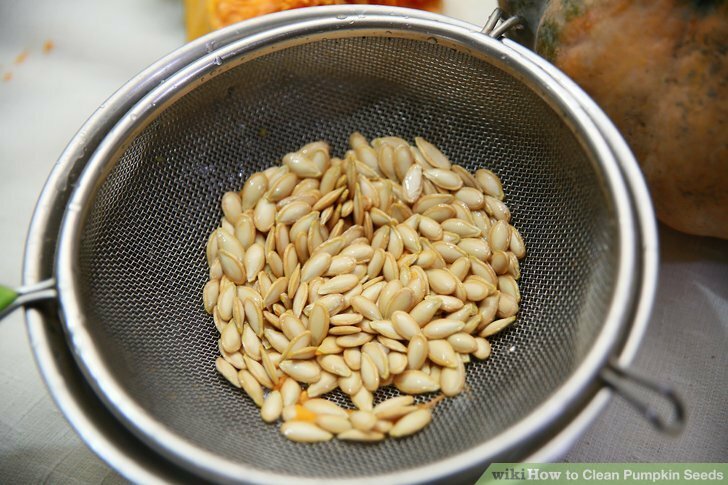 If you place pumpkin seeds in a bowl of water, the seeds will float and the pulp will sink to the bottom, making cleaning your pumpkin seeds a super easy task. Set up a work area to avoid a pumpkin seed mess. Dealing with the inside of a pumpkin can be messy. Cover your table or work area with plastic or paper towels so that you don’t ruin anything. This will make clean up much easier. 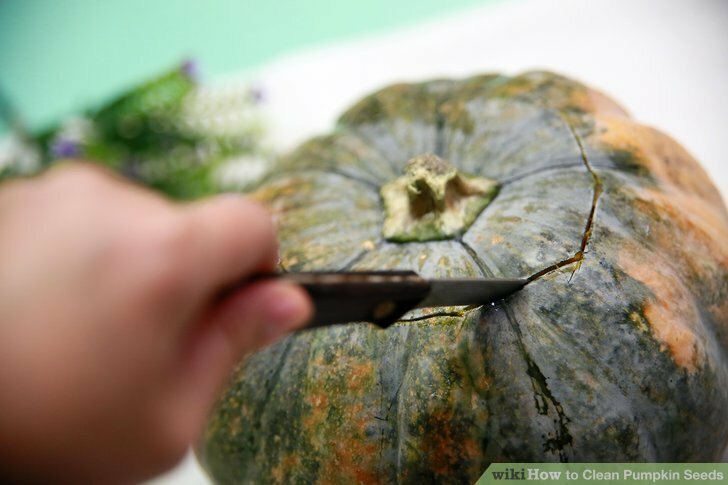 Cut a hole at the top of your pumpkin to remove the seeds. Your pumpkin needs a lid in order for you to remove the seeds, so cut a hole big enough for at least your arm to fit through. You can use a knife or tool from a pumpkin carving kit to carve a round circle around the stem of the pumpkin. The bigger the lid, the easier it will be to remove the seeds. If you wait until the pumpkin is at room temperature before cutting into it, it could help reduce the mess. Remove the lid from the pumpkin. Once you've carved a ring around the pumpkin's stem, simply lift it up and place it to the side. Now you should have a hole at the top of your pumpkin big enough to reach down inside the pumpkin and remove all of the seeds. 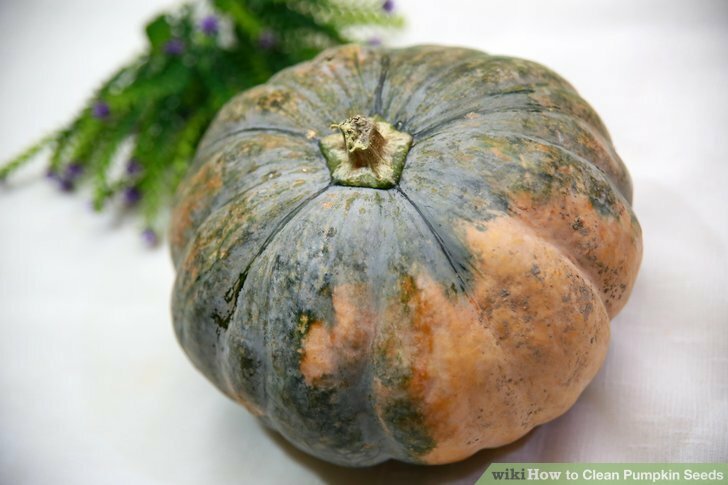 Use a scoop or metal ladle to remove the seeds from the pumpkin. 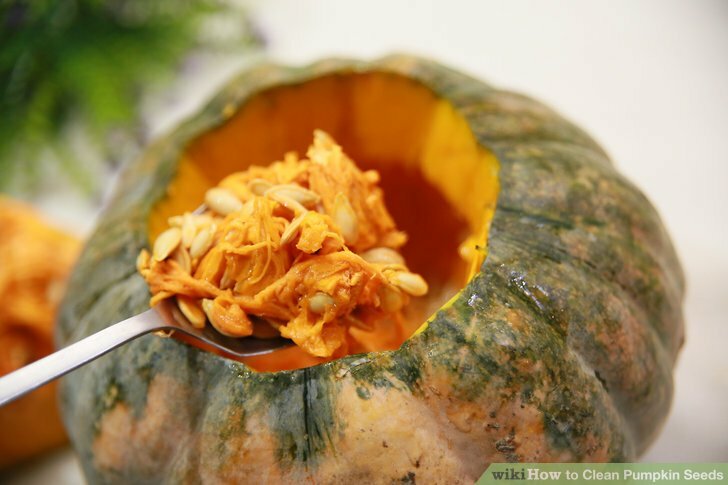 Use a scoop, ladle, or even just a large spoon to sc**** the seeds and pulp out of the pumpkin. 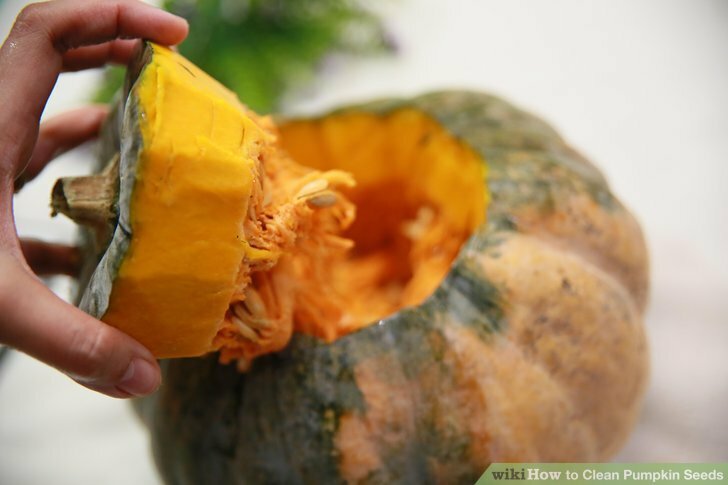 Start from the bottom of the pumpkin and sc**** up the sides, removing as much as possible. If you happen to have a pumpkin carving kit at home, you can use the scoop in the kit to remove the seeds. Put everything from inside the pumpkin into a large bowl. Take everything that you carved out of the pumpkin — all of the seeds, pulp, and strings — and put it in a bowl. Make sure the bowl is big enough to hold all of the seeds and extras with a little room to spare. You can also use a large pot instead of a bowl. 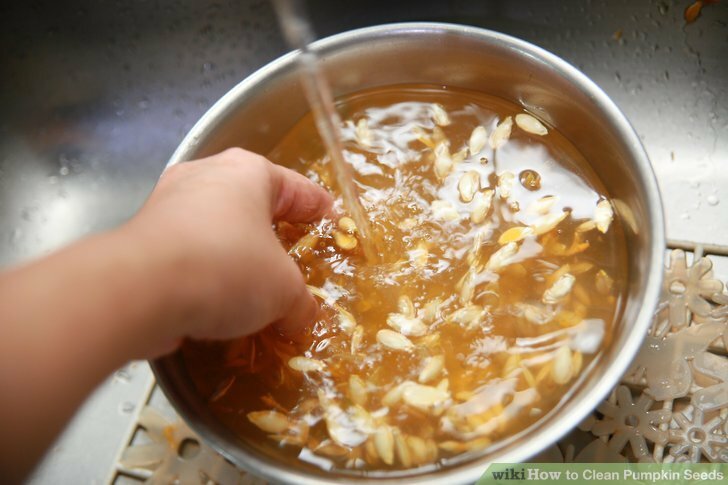 Rinse the pumpkin seeds in the bowl under running water. Turn on your sink and place the bowl underneath the running water. 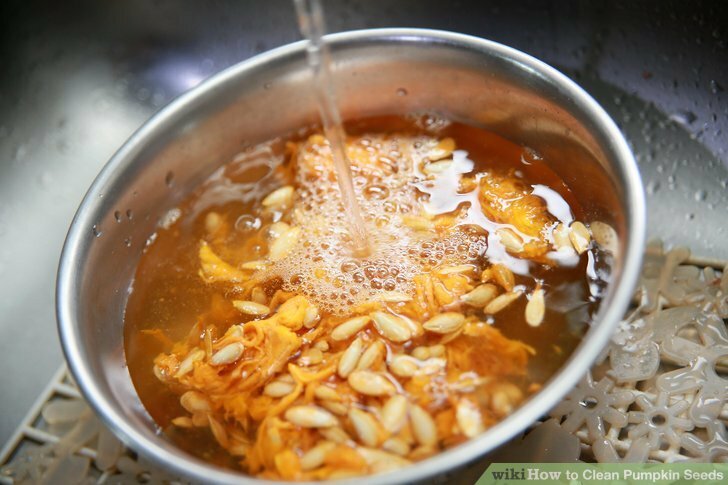 Start rinsing off the seeds while removing the large pieces of pulp from the bowl. You can throw the pulp away or compost it once you’re done. Repeat the rinse and remove as many strings as possible. 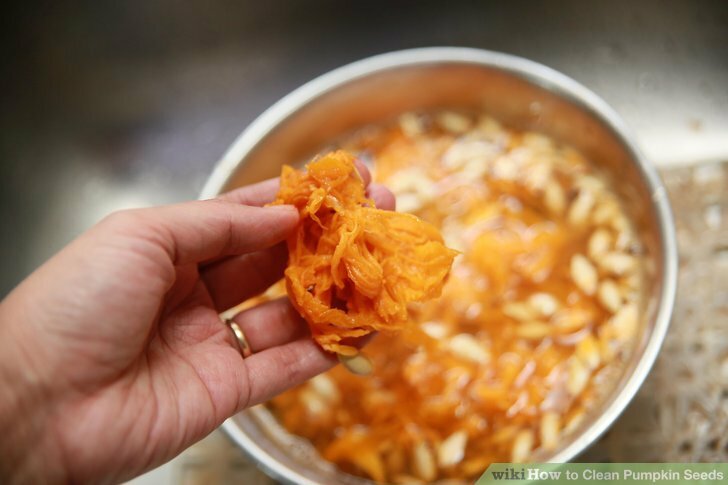 Continue to rinse off the seeds and remove any other big chunks of pulp from the bowl. Start pulling off the strings attached to the seeds. It's easiest to remove them while holding the seeds underwater. You don’t have to remove every string or piece of pulp from the seeds. Many people say it adds flavor if you keep some of them, so it’s entirely up to you. 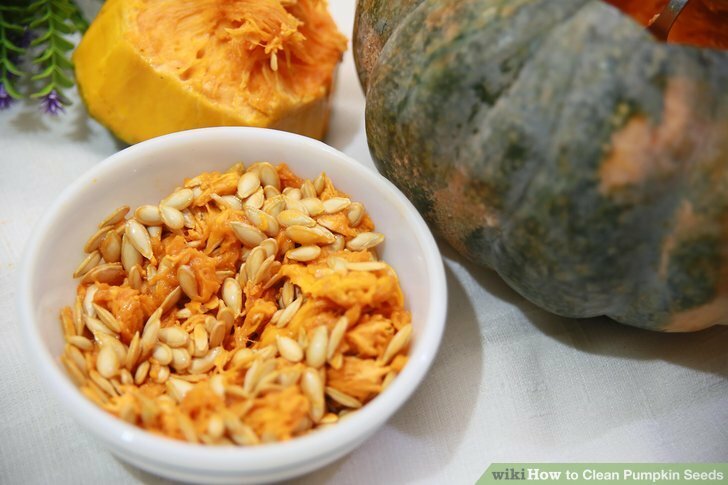 Fill the large bowl containing the pumpkin seeds with clean water. If you have extra water in your bowl from rinsing, carefully drain it out and fill the bowl with clean water. Now all of your pumpkin seeds should be floating on top while the pulp and other pieces sink to the bottom of the bowl. Skim the seeds off the top of the water and place them in a colander. Use your clean hands or a scoop to transfer the seeds floating at the top of the water to a colander. Once all of the seeds are in the colander, rinse them off with clean running water to remove any extra residue. Spread the seeds out on parchment paper to dry. After the pumpkin seeds have been rinsed, spread them out on a piece of parchment paper. Try to make sure that none of them are touching each other so that they don’t stick together. By using parchment paper as opposed to paper towels, your pumpkin seeds won’t get stuck to the bottom. You can let the pumpkin seeds dry naturally for 2-3 days, stirring them around occasionally so that both sides dry equally. You can also put them in the oven for 1 hour at to dry them out as well.